Temperatures are beginning to cool now that we’ve officially entered the fall season. While the weather is easier for us to enjoy, it also creates a better environment for pests that can damage our lawns. We’ve been on the lookout for fall fungal diseases such as Take All Root Rot disease and pests such as chinch bugs, but we’re seeing sudden outbreaks of other pests, such as Armyworms. Native to North Texas, armyworm larvae can cause a fair amount of damage during their short lifespan. Female moths, who can lay up to 200 eggs in one season, lay eggs in your lawn and other areas of the landscape. Once the eggs hatch, the armyworm larvae (caterpillars) feed on your lawn until they pupate. 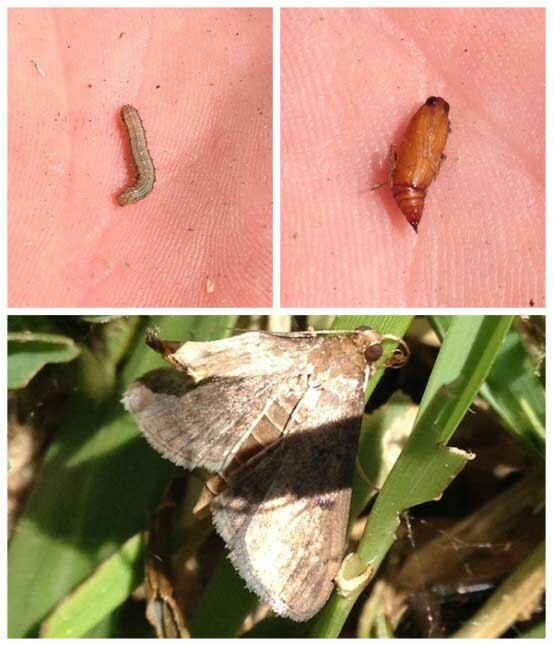 The 4 stages of the armyworm…egg, larva, pupa and adult moth. The caterpillars’ bodies are tan to greenish in color, and feature a black head with a small white mark in the center of it. The bigger they grow, the more damage they cause. It’s best to be on the lookout for the moths and treat once you see them to prevent them from laying eggs and hatching in the first place. In the last few days of their full caterpillar size, before they pupate and make a cocoon, is when they do they do the most damage. Seven to ten days later, they’ll emerge into a moth and start the process all over again. Armyworms get their name due to their pattern of marching in pairs across your lawn, leaving a wake of destruction as they feed. In addition to damaging your lawn, they also will also munch on your vegetable plants, such as beans, cabbage, onions, peas, sweet potatoes and more. Your Lawn Might Have Armyworms…. Large swaths of grass chewed down to a nub. Gray and white moths about 1.5-inches across flying above your lawn. Small, striped worms crawling through the grass. Now through November is the prime time for armyworms to cause damage to your lawn. While they will feed on a variety of grass types, they especially prefer St. Augustine grass. How do you treat Armyworms? Prevention is key. Look for armyworms before they get out of control. Armyworms prefer dark, moist areas and avoid the sun. So, look for them under leaves and in loose soil, especially on cloudy days or in the evening. If you see chewed leaves and grass, then that could be the start of an army worm attack. Cut back on irrigation in fall to reduce excess moisture as they like to lay their eggs in wet areas of the landscape. Questions about armyworms or other pests and diseases in your lawn? Give us a call or contact your landscape maintenance provider or local garden center.